Once again the French band P.H.O.B.O.S. live up to their name. With their 4th full length album Phlogiston Catharsis, which they released in September this year through Transcending Obscurity, they scare the living daylights out of you in about 47 minutes and 8 songs. You can even choose among your inner fears and demons, choose which they summon. With their mix of Industrial Doom and Black Metal they conjure an atmosphere where the good old filthy, evil demon, that goes for your flesh and bone, your heart and soul, leaping out from the dark and obscure, feels at home as well as the SF nightmare that transforms yourself from a human being into a biomechanical "cyborgian" monstrosity. The horror is complete either way, combine them and you'll enter a new dimension of angst ridden insanity. Right from the start you're immediately thrown into an atmosphere that is uncanny and terrifying. Relentless drums grab, pull and push you, while a distorted, oscillating guitar sound and echoing drones create an industrial kind of oily grimy, stenchy, nausea inducing sludge. But soon P.H.O.B.O.S. establish a hypnotic and compelling groove as well, the only hook to hold on to, and rather sooner than later to get hooked on - a psychedelic edge that somehow insists on the existence of independent humanity, or at least organic life, opposing the intrusion of mind and body by programmed machines. With every minute that the album progresses the biomechanical and brain altering metamorphosis does the same, Once the program has started it drives on inexorable and merciless with glacial precision and evil impetus. Disturbing eerie noises and vocals like beastly, demonic snarls grab for you through veiling smoke to choke you, rip your heart out or rearrange your brain cells. Unrelenting, propelling drums, dissonance, menacing drones all flow together and grow into a maelstrom of terror and insanity. The mechanic atmosphere is soaked with a sense of twisting, warping and shifting of inner and outer worlds. The subtle, underlying psychedelic vibe comes to surface from time to time, with repetitive, mesmerizing rhythms that carry spiritual, even religious aspects, as if to claim the last remaining traces of humanity. 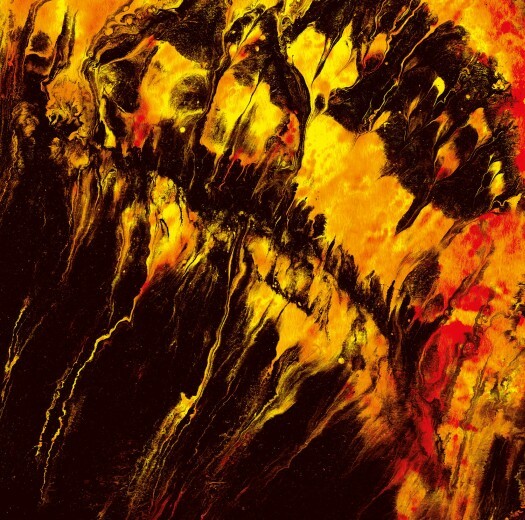 Phlogiston Catharsis immediately grabs you and hurls you into another world, into atmospheres and soundscapes that are overwhelmingly dense and intense, and especially the omnipresent duality of disturbing chaotic dissonances and hypnotizing repetitive rhythms makes it as terrifying as it is beautiful and compelling.